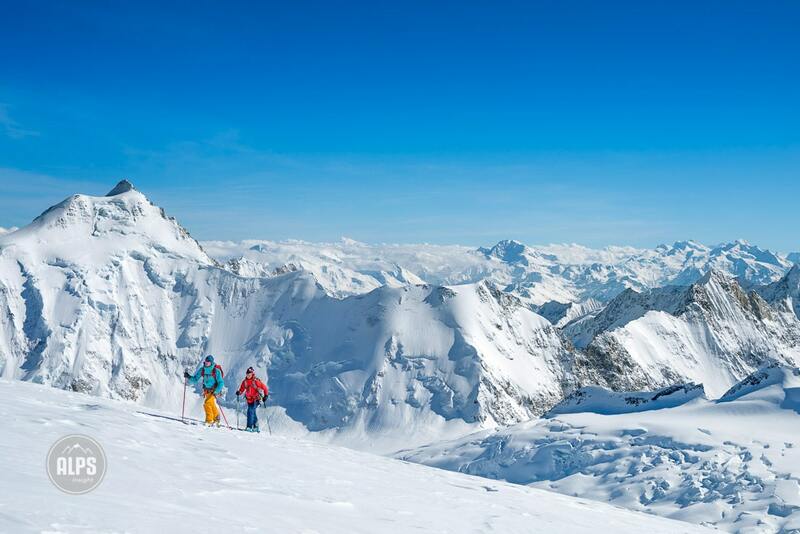 The tour is certainly amongst the Alps top Grand Ski Tours, right there with the Haute Route and Ortler. What sets the Berner apart is the huge terrain of the Aletsch Arena, the option to ski 4000 meter peaks, and a more relaxed agenda thanks to not having a point to point itinerary. 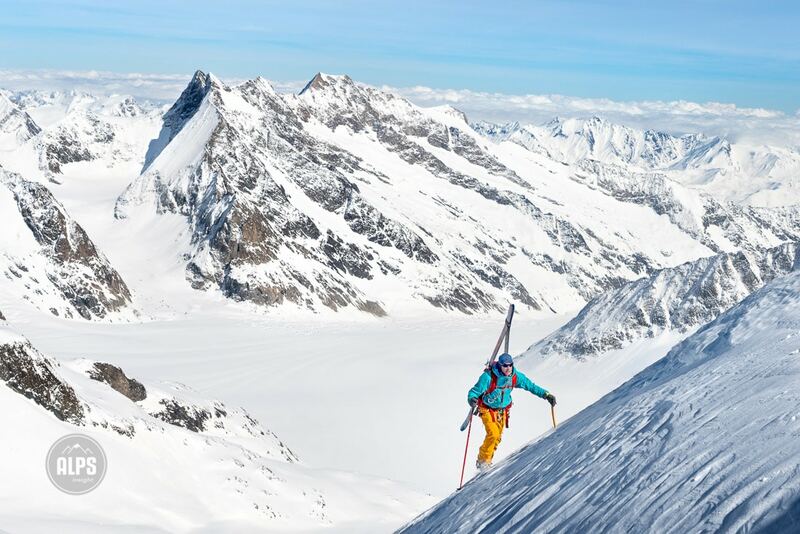 It's a skiers, and even alpinists, ski tour. 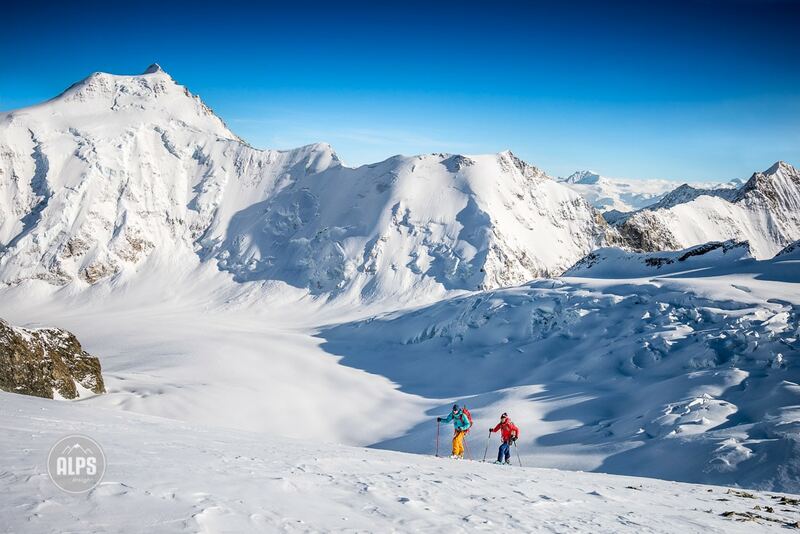 There are numerous ways to access the Aletsch Arena and countless options for itineraries. Many parties will use the Jungfraujoch train from the Jungfrau Region, on the north side, to start high and drop down to the huts. While this is the easiest way in, it is a small fortune as a ticket will be in excess of CHF100... The other options are very long climbs via the Lötschental on the west side, or from Bettmeralp or Fiesch on the south side. 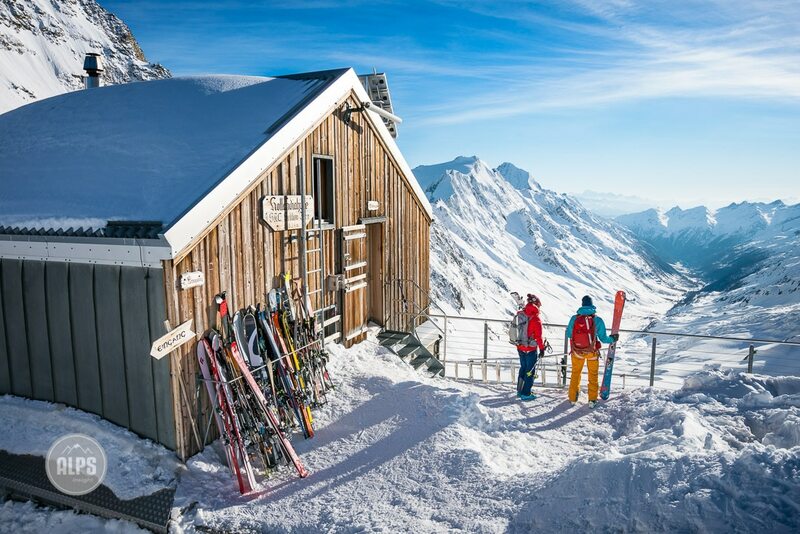 Once inside the Aletsch Arena you'll have five primary huts to choose from; the Konkordia Hut, Hollandia Hut, Finsteraarhorn Hut, Mönchsjoch Hut and Oberaarjoch Hut. From all of these huts are numerous peaks to ski either as day trips from the hut, or while en route to the next hut. A few prizes of the region are the Finsteraarhorn, a gorgeous 4274 meter mountain directly behind the hut of the same name, the Grosses Wannenhorn (3906 meters), and the Mittaghorn (3892 meters) - but these really are just a few of the many jewels. The Berner comes into season in March, when the huts open, and can extend into June thanks to being mostly on glaciers - it's all about the huts opening periods. But the season is also influenced by the conditions on the glaciers. Remember, on this tour, you are on big glaciers, in fact the biggest of the Alps, the Aletschgletscher. The issue of crevasses is serious. 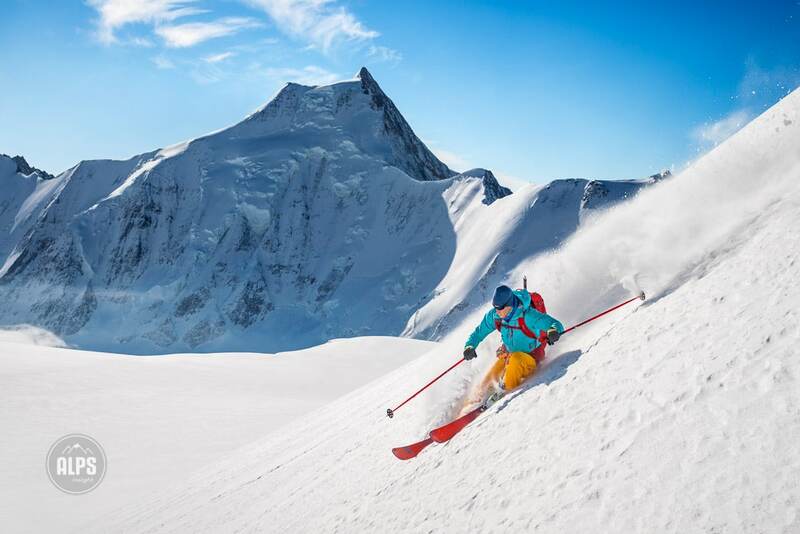 Again, it is condition dependent and a high level of skill and knowledge for skiing on glaciers is mandatory. Do not consider this the itinerary of choice - it is both ambitious and entirely dependent on perfect conditions. These are big climbs and long days requiring all the tools of a ski mountaineer. 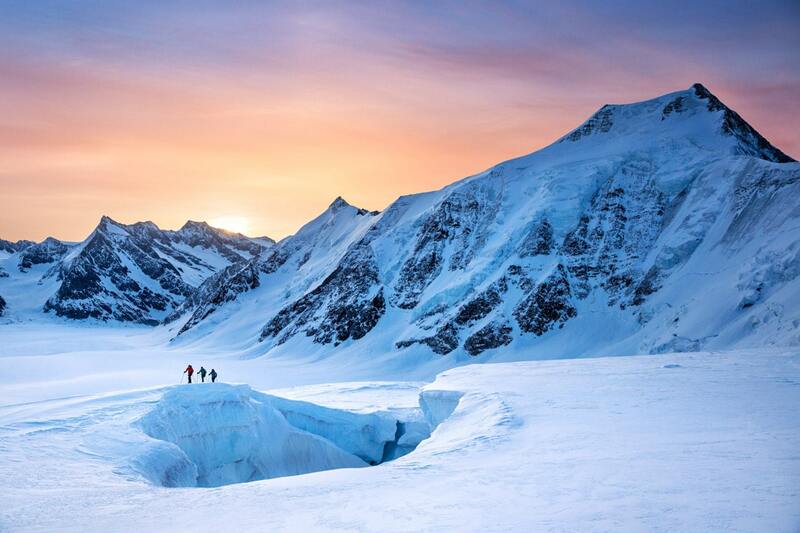 Glacier travel skills are mandatory for the time spent on glaciers each day, amongst gaping crevasses, and for navigating in whiteout conditions. 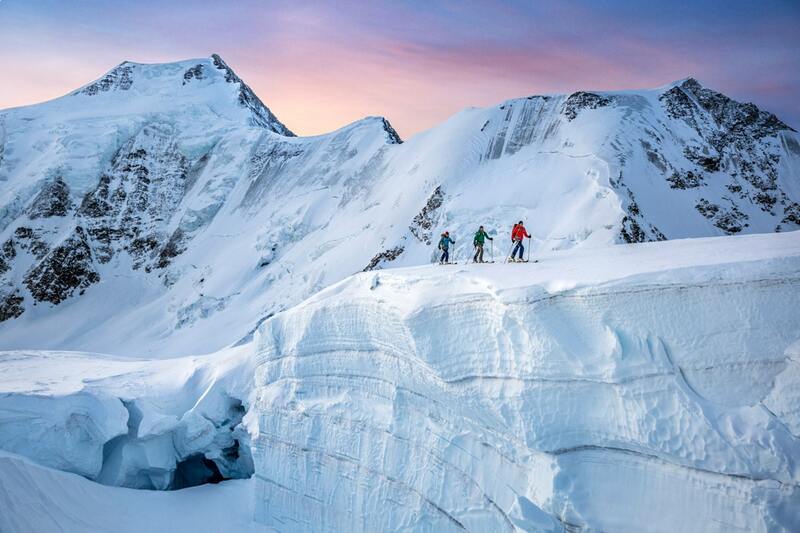 If there was ever a tour to have an experienced IFMGA Guide along - this is it. TIP: To maximize fun levels, go with someone who really knows the region. The Aletsch Arena is massive terrain and the options are overwhelming. An efficient itinerary is necessary based on conditions to avoid spending time just wandering through the huge landscape. 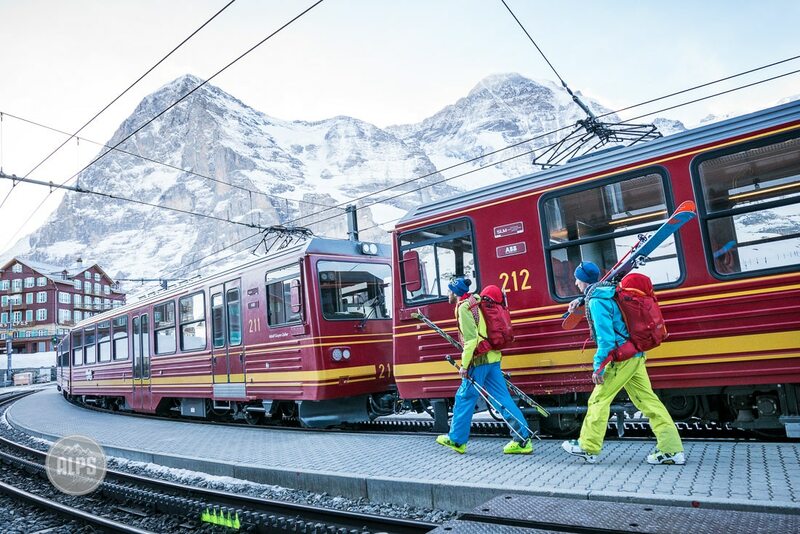 The Jungfraujoch train through the Eiger is the standard approach for the first day. Using this access you start at the highpoint and avoid huge climbs into the Aletsch Arena. Once in the Berner Oberland you'll be feeling pretty small in this massive landscape of glaciers and high peaks. Headed for the Äbeni Flue from the Hollandia Hut with the 4193 meter Aletschhorn behind. 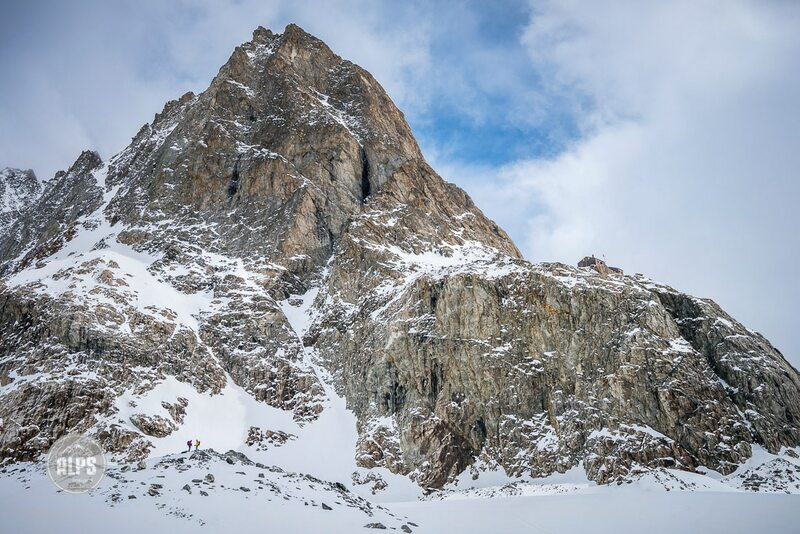 Climbing the Äbeni Flue's east face typically requires skis off and crampons. Skiing off the Mittaghorn from the Hollandia Hut. Looking down the Lötschental from the Hollandia Hut. On a clear day the views from the Berner Oberland stretch to the mountains of the Wallis. 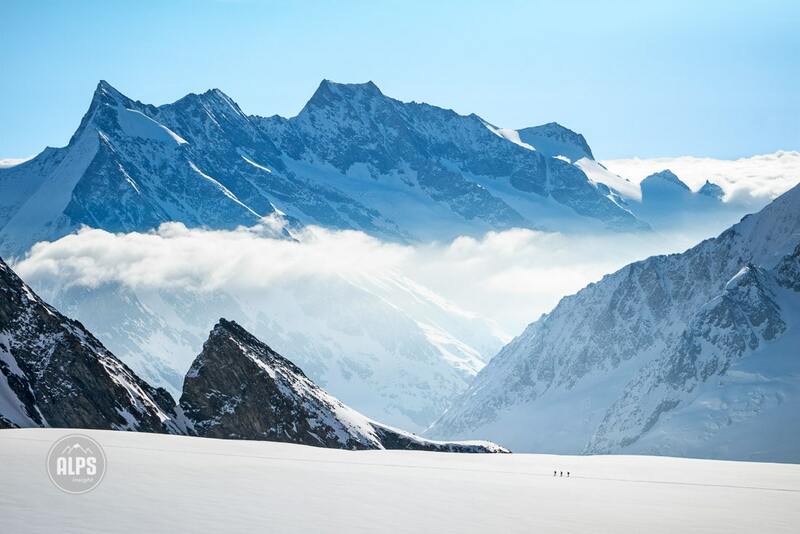 Two skiers dwarfed by the landscape before heading up to the Konkordia Hut, visible on the plateau above. 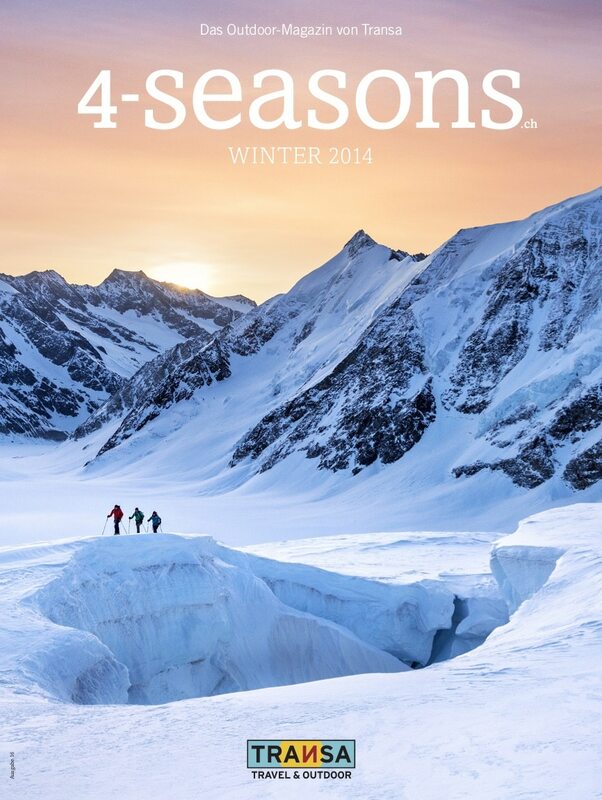 The Berner Tour on the cover of Switzerland's 4-Seasons Magazine, by PatitucciPhoto/ALPSinsight. Thanks! This is exactly the stuff I hoped you would start posting. If you can, more single-double day tours, something suitable for beginners would be greatly appreciated! There’s so limited English language ski-touring resources for most areas of Switzerland. Thanks for the comment. Keep an eye out for more touring posts coming soon.